Three Girls Reading, painting by Sir Walter Firle, 1829-1959. Many of you have asked for a list of books to help in raising girls and help guide their hearts toward purity. We want them to grow to be highly capable of living in the world – but not be a part of it. One thing parents can do in raising girls to be adult women full of integrity and wisdom is to read books (with and to them) that sow the seeds of those character qualities you wish to develop. Start at a young age, drawing her to know Christ and how He would have her live. Raising girls in this culture is challenging. I’m not telling you anything you don’t already know. We home-educated, and so I began mixing academic lessons with character-building content. It kept our school days interesting and full of good things to discuss mother and daughter. Appealing to both boys and girls, the Miller Family series was one of our earliest to read for teaching character, from the littlest on your lap to age 12-ish. These books were a pleasure to read and brought both laughter and surprising insights. Although we are not Amish, our children have said these books will be read with their little ones someday – they are a tool to reinforce discussions that we aren’t sure how to approach with our children. So well written, they grab your heart. They speak to your heart as well as to your head. They touch on deep feelings and classic themes that all of humanity can relate to ~ injustice, mercy, forgiveness, friendship, reality, honesty, hope. I had a growing desire to provide the richest content in books that I could afford, so I started to shop all the old bookstores I knew of. I shopped the homeschool convention resources and worked extra hard to cut corners to save extra money for character books. I was purposeful, praying for direction before I left to look. The Lord seemed to guide me to some great finds for raising girls. If you have not yet read Why Have We Stopped Protecting Our Daughters?, see why these culture-correcting reads are so vital to the emotional health of our girls. And we wonder why we have girls dealing with depression and eating disorders – why they feel they can’t measure up to the world’s elusive definition of beauty! I read these to my daughter as a young girl (she wanted to hear them over and over), and I believe they were instrumental in her heart development. These books talk directly to older girls about what authentic, true beauty is and how they (God willing) can experience a romance that will transform every part of their existence and fulfill the deepest longings of their feminine heart. Help them see that they no longer have to look to human relationships to meet needs that only Jesus Christ was meant to fill. B eautiful Girlhood and The Companion Guide to Beautiful Girlhood are ideally to be read with Mom up until approximately age 13 -there will be overlap of age appropriateness. Set-Apart Femininity and Authentic Beauty are for a bit older (14 and up to adult), and both have companion guides (see below). All of them are very helpful for us moms, too! Writes Your Love Story (Expanded Edition): The Ultimate Guide to Guy/Girl Relationships, by both Eric and Leslie Ludy. And as for Evidence Not Seen (in photo above)~ it is both my daughter’s and my favorite adult book. Darlene Rose and her terrible and triumphant story will likely change your daughter’s (and your) life. It is a true story about courage, steadfastness, hope, miracles, and love for people. We give the book an A+ – even that rating seems a trifle to me – there should be something higher. My daughter’s favorite childhood book (A Peep Behind the Scenes) opened her mind to the fact that ‘all that glitters is not gold’. Moms, I now have 2 posts available on character-building books for boys (that they will enjoy reading) here and here. Again, raising girls isn’t easy, but inspiring our daughters through great books as early in her life as possible will open her eyes to truths she might not internalize otherwise. *Sigh* This has been a rough day…I think Satan does not want this list of books for raising girls to be shared for some reason…Hmm. Why do you think that is?!? I’m sure this post will be a light to many parents who’d like a little help instilling Godly values in their children. Our children are grown, but we still keep a library of wholesome reading material for ourselves and our granddaughters when they visit. I agree, the Lamplighter books are excellent. Thank you for the list. GREAT POST! Thank you for sharing!!! Oh, you love the Pansy books too!!! I just finished the Ester Reid series last week as a proofread for our family and realized I had so much to learn myself from them (LOVED THEM)! I was planning on writing about them soon… And… this was my topic for the guest post, “living books”! Guess I need to change it up now 🙂 We have 90% of the books you mentioned so I will definitely look to add the other 10% dearie 🙂 My daughter loves the Peep Behind the Scenes too… She listens to the audio version when she folds the never ending stack of laundry. Thank you so much for posting this. I only have two daughters as of now (ages 6 and 3…and two boys, looking forward to the other book list :)), and have written down each and every title on an index card to keep in my wallet so that I can purchase them over the next couple years. Tracey, did you see what Kelly just shared? There is a new one!! One of the books that stands out to me from when I was a high school homeschooler is Elizabeth Prentiss’ Stepping Heavenward. My mom used it as a character-building book and I recently re-read it a few years ago and was as convicted now as I remember being then. Also, Mary Kassian has a book for high school (and older) girls – Girls Gone Wise in a World Gone Wild which covers everything from dress to habits to body language to speech and many other areas. Thank you for the reminder about Stepping Heavenward…I took a photo and forgot to put it in the post :-] Blessings! Thank you for sharing such wonderful resources. Many of these are our favorites as well! I am looking forward to reading some of these that are new to us, too. May I share the link with the other moms in my home school group? No, Kelly, I didn’t! That is exciting as we will order it to add to the series 🙂 I wonder if we will be able to freely order these excellent Christian materials for much longer…I am ‘stocking up’!! Thank you! I just pinned this post, I love all these great references. Thank you! Thank you so much for sharing! I’m really looking forward to your list for boys. I was encouraged to see that we have some of the books already, and excited to see more that I can add to our library. It is hard to sort through all the options to make sure you get something truly Biblical, thanks for helping! The Miller Family series!! These have been the favorite of our family! Even now the older nesters will ask is we can use Wisdom and the Millers for devotions! When we tell them we are having devotions in Proberbs they always ask if we are doing Wisdom and the Millers! When we are approaching Missions Conference at church Missionary Stories and the Millers is the must read of the evening! So many precious memories! Thanks for posting the wonderful list! I will be looking forward to your list for boys/young men! Love this list! I still remember reading Pollyanna with my grandmother when I was a girl, and I did a Beautiful Girlhood study with Mom when I was about 12 or so. We loved the What Katy Did books, too. I’ll have to remember some of these for the mother/daughter group at church. We have a lot of these! I just ordered five of the ones we don’t have. I love to read and feel very blessed that God has led our family to pick very carefully when it comes to what we put before our children’s eyes and hearts. It is so very important and they become able to discern by our direction when they are young. Thank you for your wise advice, Mrs. Jacqueline! I pray that you will have a better day today. Wow! I am thankful to hear you and your family are okay after the lightning strike! Be faithful! You are a wonderful encouragement to me and many others! I just wanted to post some of our favorite books that others might like. We have enjoyed the Moody Family Series by Sarah Maxwell. It is about a homeschooling family and their desire to honor their parents and get along as a family. We devour ANYTHING by Douglas Bond. We have read through Ten Peas in A Pod about a homeschooling family in the 1950s as a family and laughed out loud! Librivox has several G.A. Henty and R.M. Ballantyne audio books available for free download. These are great historical fiction and have been favorite lunchtime books to listen to for years! I am so pleased to see these suggestions for when someone asks me if I have any ideas on character building books for girls. We never had any girls although I have heard of “Beautiful Girlhood” and could recommend that one. Character was important to us as well and we did character training when the boys were little as well as went through books with them, etc. Thanks so much for linking up to “Making Your Home Sing Monday” today! My daughters are 8 and 9. Already talking about boy friends and such. What age do you think is appropriate to start reading “Beautiful Girlhood”? I was looking through it the other day, and thought I don’t know if this would be over their head or not? Thank you for your thoughtful reply. 🙂 I appreciate it. I am absolutely so thankful that I found your blog about a year ago! I always pray for Titus 2 women in my life. Bless you!! Thank you SO much for that encouraging word, Jennifer. I am blessed to pray for you younger gals that are busy raising up your young children. May the dear Lord fill you with His Holy spirit and give you strength and wisdom for each day. Remember to love on your man, dear one! He needs the confidence only you can give him! What an amazing list of books. I will check some of these out. I adore your husband’s gift certificate. Stopping by on the Kid Lit Blog Hop. Thank you for joining! 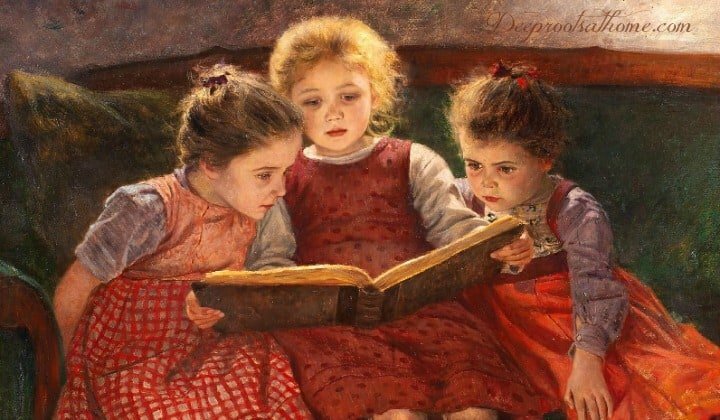 Thanks for this great list of books for girls. My 9-year-old daughter is at that perfect age to really start thinking about these types of influences. Thank you, Renee~~ I love to ‘meet’ new friends and like-minded Moms 🙂 Blessings to you and your family! Saving this post. Thanks for a great list for girls! Just this afternoon I finished reading “Evidence Not Seen” after first learning about it here! What an adventure that was! Her story was fascinating, gripping, sorrowful, and over-all epic. And her faith in Christ Jesus was terrifically inspiring to say the least. Thank you for the wonderful recommendation! Oh, Elizabeth! I am thrilled you got it and had the same blessing! To me it is one to read once a year for encouragement and perspective, if nothing else 🙂 God bless you, sweet sister! From a dedicated mother guiding four beautiful young girls through the storms of this world… Thank you for this inspiring and informative post (and your blog)! It is my pleasure, Kacy!! God bless you, dear Mama!! I shall keep trying to find them however, because I’ve heard they are really good. I don’t know for sure, but that could have been bogus, just to get more money from the postage. I am in Australia, and most shipping from the US is expensive. I usually use the Book Depository, but they don’t have those titles either. Thanks for your posts I enjoy reading them and I like to share them on facebook also. They resonate with me so much, especially the ones about how our young girls are being brought up these days. On a better note, the books that I have bought recently have been good. My oldest really liked Thee, Hannah! And we are about to start on Sarah Noble soon, probably when I get over the cold that I’ve picked up. Ah, dear Tara, I am sad for you! I am praying right now that the Lord will make a way for a Miller’s Book somehow! His eye is on the sparrow and I know He watches us even more!!!! May He pour out His rich blessings upon you and yours! I was wondering if you had heard of this book. I was purchasing something else and this was recommended. It’s called The Mother at Home by John S.C. Abbott. I know you have read many books and was wondering if this is something you had come across over the years and would recommend. I was not raised in a Christian home, and am struggling trying to raise and discipline my children in a biblical way. It’s hard as I was only born again about 4 years ago (and being the sole parent), so I am still learning things myself as I’m trying to raise my children. I have not heard of it not the author John Abbott. It sounds a lot like Homemaking by JR Miller (one of my very favorites):http://amzn.to/1tZesI4 If you click on the middle box that says hard cover, you can select from used and new from 1 cent plus shipping to under $4.00 for new plus shipping, plus I like the cover of the mother and child so much more than the portrait of JR himself 😉 It speaks about marriage, and even though you are a single Momma, it will be helpful to see the ‘picture’ of what God intended for marriage. It helped me so much! J.R. Miller’s writings are just so warm and encouraging! I hope that helps! Blessings! Thank you for sharing this book list. You are the first and only person besides my husband who seems very like minded in my choice of books. I even read your last comment about J.R. Miller, another one of my favorites. : ) I cannot wait to divulge into many of the books that you have listed that we have not read or do not have for our children. Thank you again. Thank you so much for this post. I have looked for a list just like this for a while. Hi Tara from Australia, I am from Australia and I bought a set of the Miller Books and the postage was about $20 for all the books & workbooks set. The link is here http://www.milestonebooks.com/item/20-5–/ Hope it works for you. God bless you. We love the Miller books. That is terribly expensive shipping, Suzanne K. We have friends in Canada and were recently astounded at what they pay in shipping as well!